The Prime Minister wants to change the flag, Andrew Little wants to change the national anthem and the leader of the opposition, Winston Peters, doesn’t want to change anything, except perhaps the number of Asians we allow to settle in our Godly of nations. Meanwhile Masterton’s lady Mayor goes on the airwaves exalting the good citizens of the town to buy locally and support our business people. It’s a good message; and timely too. With no data to confirm this, I suspect the only growing enterprises at the moment are the courier companies whose vans are seen speeding around the town delivering goods from countries afar. If Mr Key and Mr Groser’s claims are to be relied upon, and the Trans Pacific Partnership is passed into law, these goods are likely to become even more competitive. I walked up the main street of Hamilton one Saturday morning recently looking for somewhere to have lunch. Provided I liked Asian food the choice was overwhelming, but the number of empty shops was surprising and distressing. The once buoyant Victoria Street has all but died. I asked the locals what had happened and they told me the Tainui people, bursting with money from well-managed investments, had recently built a huge shopping centre at Te Rapa with acres of free carparks. 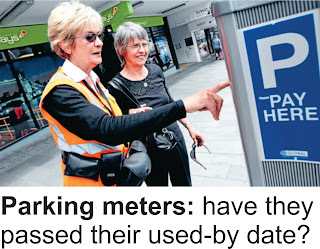 They said no one wants to feed parking meters these days and so many main street businesses had failed. Local retailers here are facing the same problem. Masterton’s pseudo-mall, the Warehouse sells most everything and as a result you can get a park in Queen Street pretty well whenever and wherever you want. But you pay. The shopkeepers want the council to consider a parking regime-change allowing the first ninety minutes free. They cite the story of a town in West Wales called Cardigan where vandals smashed all the parking meters and the council can’t afford the 22,500 pound bill to have them repaired. This has led to a surge of visitors to the town centre with shop owners claiming sales are up by 50 per cent. The small retailers, who were still paying exorbitant property taxes, and seeing an ongoing decline in business, have long blamed parking meters pushing shoppers away from local high streets to out-of-town superstores. And so change is in the air, the flag, the anthem and perhaps the parking meters. But it was recently brought to my attention that the biggest change facing my generation is Facebook and not really coming to grips with just how it works.